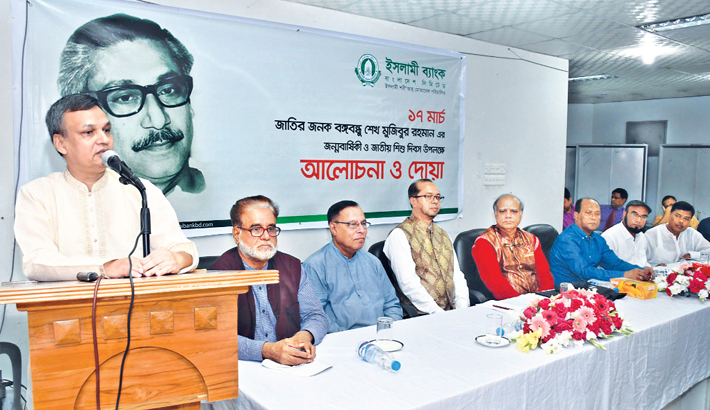 Islami Bank Bangladesh risk management committee Chairman Engineer Abdul Matin speaks at a discussion marking the 99th birth anniversary of Bangabandhu Sheikh Mujibur Rahman on Panthapath branch premises in the capital on Sunday. Islami Bank Bangladesh Limited organised a discussion meeting marking the 99th birth anniversary of Father of the Nation Bangabandhu Sheikh Mujibur Rahman at its Panthapath branch on Sunday. Engineer Abdul Matin, Chairman, Risk Management Committee of the bank, was present in the programme as the chief guest, said a press release. Presided over by Mohammed Monirul Moula, Managing Director (Current Charge), the programme was addressed by Professor Dr. Qazi Shahidul Alam, Helal Ahmed Chowdhury, Md. Syful Islam, Md. Joynal Abedin, Syed Abu Asad and Md. Quamrul Hasan, Directors of the bank. Abu Reza Md. Yeahia, Deputy Managing Director addressed welcome speech. Mohammad Ali and Taher Ahmed Chowdhury, Deputy Managing Directors of the bank along with top executives and officials were present on the occasion.